The easiest way to connect a 3.5mm jack to a seemingly inaccessible aux port. Whether it’s because of a protective case, or an L-shaped or right angle connector on your audio device, this cable is the ideal solution. 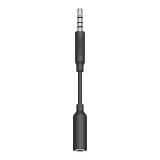 With universal 3.5mm ports at each end, one male, one female, the extender literally bridges the gap between your devices to let the audio play. The Mini Aux Extender is compatible with all devices with a 3.5mm AUX jack or port, which makes it a handy quick fix for physical connection issues between your devices.